We have been commissioning research on workplace trends for over 10 years. This research, which canvasses the opinions of over 20,000 senior managers and business owners, explores the increasing trend in flexible working around the world. This report reveals how businesses are adapting to this change, one of the most significant developments in working practices for decades. It would be impossible to talk about remote working without acknowledging the role of technology as a key enabler of mobility: business people are able to work outside one of their main office locations, or indeed outside of an office at all, thanks to ubiquitous Wi-Fi and mobile devices such as smartphones, tablet computers and even trusty old laptops. Without these devices business people would have to constantly return to their office to send an email, talk to their colleagues, check a document or print off files. The speed at which technology has evolved means that not only are business people able to take their work around the city as they hop from meeting to meeting, or home in the evening, but they are also able to carry out these tasks and remain cost-effectively connected with their team or their management thanks to solutions that have made even telephoning seem cumbersome and old-fashioned. Examples of these solutions are:- instant messaging, that replaces, for the employee working remotely the act of leaning across their desk to ask a colleague a quick question; or VoIP, that allows users to call or videocall very cost-effectively from their devices. Yet all these solutions are predicated on one key ingredient: a strong and fast internet connection. Without this, mobile working is severely limited. Another key driver of remote working is the changing workforce: as generations grow-up expecting to be able to communicate cheaply and rapidly from anywhere in the world, it follows they expect this to also be the case in the professional arena. A whole host of literature is available analysing and outlining the different attitude towards work:life balance that younger generations (starting from Millennials) are introducing and making the norm in the world of work. Specifically, a generation that is completely aware of how impossible it is to switch off technology and make oneself unavailable for even a few hours, is clamouring to at least be able to enjoy the reverse of this phenomenon and to carry out their work tasks freely from any location they choose. It’s not just younger generations, however, that are demanding and enjoying a more flexible work environment. Older workers, forced to (or choosing to) delay retirement are also better able to combine their personal life with continued workforce participation if they are not required to face a gruelling daily commute. 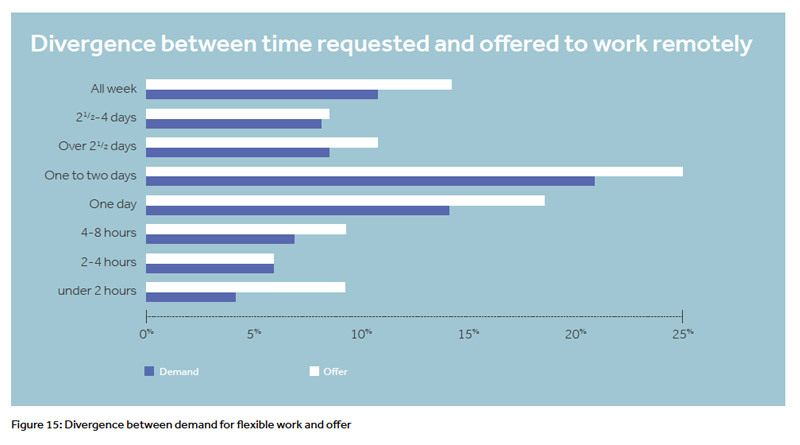 This latest survey also shows that today’s workforce is increasingly composed of freelance workers and consultants as well as part-time workers who actively seek out the opportunity to work more flexibly. From spending more time on leisure and loved ones, to cutting down commute times and finding more time to relax, workers prefer flexible working for a host of reasons and for many it has now become a key differentiator when faced with a choice between similar jobs. This is an important aspect to consider for businesses seeking to acquire top talent, as today’s workers are reporting that it’s not just salary which makes a difference. Add to this the fact that our research shows improved concentration levels and productivity are benefits of flexible working, and the business case is made. As more and more workers demand to work flexibly, and with all the technology available to enable them to do so productively, it is hardly surprising to find that businesses are marrying their need for greater agility (rapid response to market changes) with helping workers achieve greater personal happiness and work:life balance. This research shows that the trend towards increasing use of flexible work locations instead of fixed leasing arrangements doesn’t only concern SMEs but is actually applicable to all types of firms. Taking a more flexible approach to how they manage their premises as well as hiring more consultants and freelance workers allows businesses to be more responsive and better placed to embrace growth, as well as navigating choppy waters should they arise. In short, today’s workplace is becoming radically different from that demanded by the previous generation – a phase change compared to twenty years ago – and this reflects the composition of the workforce which is now richer in flexible working roles and more open to valuing employees on performance rather than face-time. As the world of work evolves, Regus is at the front line, taking its pulse and helping businesses grow and prosper. The world of work is being dramatically propelled into the future faster than ever before by a heady mix of new technologies and the demands of a workforce that is increasingly calling for a better work:life balance. In fact, over 50% of workers now report that they work outside the main office 2.5 days a week or more. But where are business people carrying out their work if they are not in the main office? Almost a third report they work from different locations in the same city and a quarter say they are working from other cities suggesting that business people are finding they need to remain productive while on the move and between meetings. Only 36% say they exclusively work from home when remote and it’s easy to see why: workers report that home working is seriously damaging for productivity and doesn’t convey a professional image with family members, with pets and household noises disturbing calls and concentration levels. More importantly, workers report that at home they are unable to access key office equipment and a reliable and speedy internet connection. Although working closer to home helps business people improve their schedule and see more of their families, they clearly would rather not work within the home and report that working remotely is ideal to help them be closer to client meetings. One of the main enablers of flexible working is of course technology. A number of apps allow workers to remain connected and productive at all times from laptops, tablet computers and smartphones. Similarly, business people are making more and more use of solutions that let them access files and desktops remotely through Cloud applications. Technology already provides these workers with all they need to stay connected with their teams and access their files and documents wherever they are. Specifically, VoIP calls and instant messaging apps are increasingly used by workers on-the-go to keep in touch with colleagues and staff cost-effectively: all that is required is a fast internet connection to make them feel as though they are in the office. And management agree, reporting that rather than relying solely on expensive and invasive IT to track productivity, workers should simply be having regular meetings and catch up phone calls. 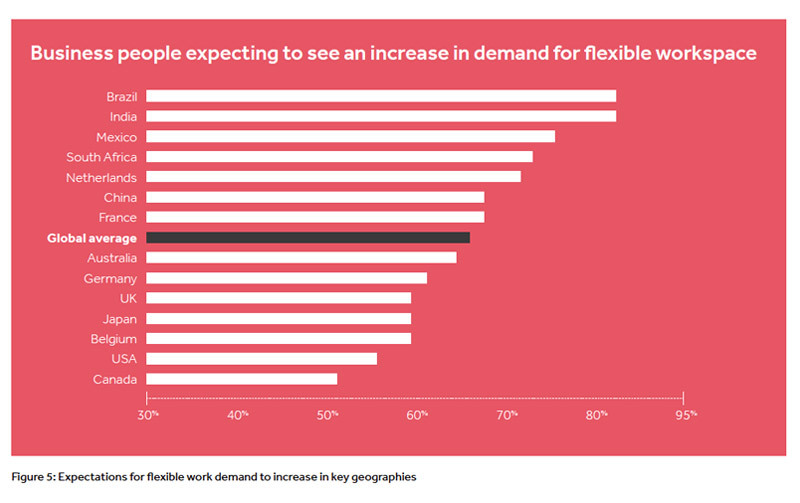 The other key driver of flexible working is worker demand: as businesses report that they are seeing more consultants and freelancers populate the workforce, it is hardly surprising that the need for flexible workspace is also expected to continue to grow. Combine this with the need to find a better work:life balance (voiced by Millennials and by an increasing number of people adapting their working habits in order to remain in employment beyond pensionable age) and you have the perfect recipe for a more mobile workforce. But businesses stand to benefit too, with firms of all sizes expected to embrace the demand to work more flexibly and to promote agility by reducing fixed office costs and avoiding fixed leasing arrangements. Reports confirm that today’s workforce is radically different to that of just twenty years ago. Not only have new technologies enabled ways of working that would have seemed impossible just a few decades ago, but the speed of reaction required by every worker – as well as the sense of being always connected and available over email or telephone – have given rise to a greater need for work:life balance and for workers to carve out personal time in a world where professional and leisure ‘space’ have become increasingly confused. Smartphone penetration in the UK now stands at a staggering 91% for 18-44 year olds and over 70% for Belgian, Dutch and German adults. France falls slightly behind the EU average at 61% and is closer to the Chinese 62% but still remains well above 50%. It is not surprising, therefore, to find that apps that have been specifically designed for mobile use are becoming increasingly popular and at the same time further driving flexible work by making it easier for business people to remain productive on-the-go and for teams to stay connected. In 2015, global mobile app revenues amounted to $69.7 billion and in 2020, mobile apps are projected to generate $188.9 billion in revenues via app stores and in-app advertising, signalling that more and more users will be downloading and making daily use of these tools. Users prefer apps to mobile sites and spend 90% of mobile time on them rather than on browsers as confirmed by Flurry Analytics (June 2015). And yet all these apps and solutions ranging from VoIP, to instant messaging, to video sharing, to remote access to servers, desktops and the Cloud all rely on a fast and solid internet connection. Unfortunately, the speed and quality of internet connections varies greatly and impacts workers’ ability to be productive and efficient remotely. In January 2016 the British Infrastructure Group revealed that in the UK 5.7 million broadband customers had internet connections that do not reach Ofcom’s acceptable minimum speed of 10Mbit/s, around 3.5 million of these are based in rural areas. In the EU studies have shown that average speeds of broadband are actually 75% of those advertised. It would follow that home working can therefore not be expected to be as efficient if workers are located in rural areas. Without a suitably fast connection it is impossible for businesses to provide workers with access to servers in the Cloud or to desktops. VoIP and uploading of documents on file sharing devices are also cumbersome and time-wasting if the IT infrastructure isn’t up to speed. In the EU 19% of enterprises used Cloud computing in 2014, mostly for hosting their e-mail systems and storing electronic files. 46% of firms used advanced Cloud services for financial and accounting software applications, customer relationship management or to run business applications. Brazil’s Cloud computing market revenue was $217 million in 2012 and it is expected to reach $1.1 billion by 2017, while in Latin America in general 66% of businesses are adopting Cloud technology. Given the evolving technology landscape it follows that Millennials and Generation Z, who have grown up accustomed to using technology in everyday life and remaining connected 24-7, are applying the same speed of communication and reactivity to their professional life. A study by Bentley University shows that 89% of Millennials regularly check emails after work, but being constantly connected has a trade-off and that is Millennials want more freedom of location and 77% report that flexible work would make them more productive. As Millennials will compose 50% of the workforce by 2020 it is important for businesses to become attuned to their needs or risk paying the hefty price of replacing them, which averages $25,000 a USA report found. But it is not just younger generations making their mark and driving the quest for mobility in the modern workplace, older workers, obliged or willing to remain in employment beyond retirement are also demanding more flexibility. The OECD report that in the 55-64 years age bracket 56% of people are now employed compared to 48% in 2014. In Germany employment rates for older workers are 67% for 55-59 year olds but most importantly in Germany, the Netherlands, Belgium and France, the increase of older workers in employment beyond retirement between 2004-2014 has been above OECD average signalling an important shift in workforce composition. Another USA report confirms that more and more workers are choosing not to become employees but to retain their freedom and freelance or work as consultants. The study shows that more than one in three workers in the United States are setting their own hours and being their own bosses. 42% reveal that they chose this path to have more flexibility. Research in Canada confirms that freedom of choice linked to greater flexibility is a game-changer in work:life balance as having a flexible schedule that enables individuals to choose when their work day starts and ends is associated with slightly greater satisfaction: 79% of employees with a flexible work schedule reported that they were satisfied or very satisfied with their work–life balance, compared with 73% of those whose schedule was not flexible. One of the key drivers for all types of workers to demand more flexibility is in order to improve their quality of life be it by reducing their commute to spend more time with loved ones, in the gym or simply to get more sleep. Regus research has shown that 27% of workers regard their commute as a ‘waste’ of time so it is hardly surprising that Indian workers who commute on average 38 minutes each way compared to the global average of 33 minutes, should be concerned about winning back some personal time and choosing where they work from. Japanese workers also face a lengthy commute (39 minutes each way on average) and the OECD reports that in Japan the share of people working very long hours is higher than the average. 28% of workers in Mexico work long hours, well above the OECD average of 13%, highlighting the importance of reducing commute times and regaining work:life balance in this country. The same concern also applies to Australian workers who have been found by the Australia Institute to produce $110 billion in unpaid overtime every year. 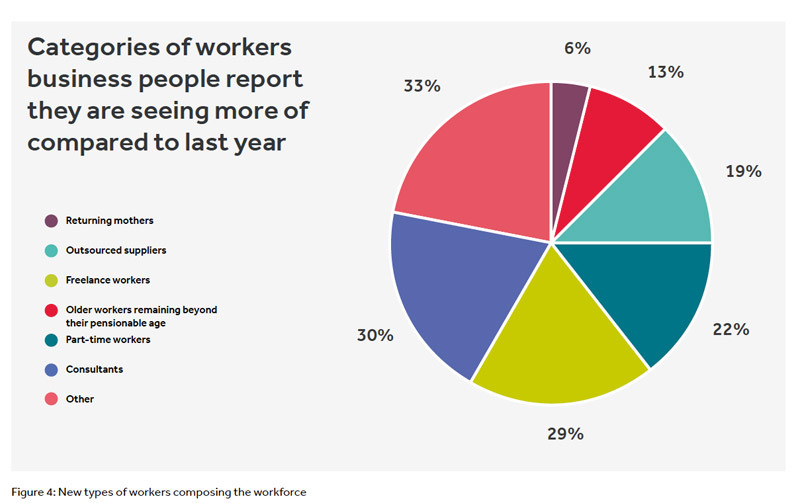 These new types of workers are almost certainly in part responsible for the increase (66%) of respondents who expect to see increase in the demand for flexible workspace be it business lounges, co-working spaces, short-term offices or drop-in centres. The proportion of business people globally that work outside one of their company’s major office locations half the week or more has now reached over 50%. This signals an important shift from a workforce that is predominantly office-based, to one that is at least partially mobile. Many businesses have introduced a remote work day for all employees or those with families and although these workers cannot be thought of as ‘remote’ workers, they are nonetheless revealing that up to a fifth of their working week is not carried out from one of their company’s main office locations. Yet actually a lot more workers carry out a few hours of work remotely each week, whether this is because they are taking their laptop home to finish something off in the evening, or carrying out conference calls as they move from one meeting to another, or even simply catching up on emails as they commute back home on a busy train. 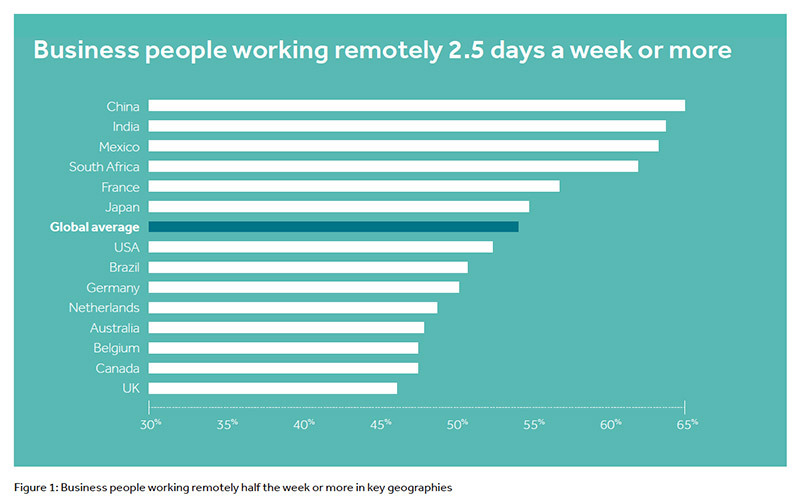 At the other end of the spectrum only one in ten are ‘pure’ remote workers staying out of main premises all week. The research investigated the topic further and looked into the physical location where work is being carried out when not in one of the company’s main offices and found that only a minority work exclusively from home (36%). Rather, workers suggest that they work remotely in order to remain productive while travelling to and from meetings within the same city or in other cities (57%). Choice of location therefore mostly falls on business centre and café’s which, however, are regarded as too noisy and unproductive by most as revealed by Regus research in 2013. This clear shift in working habits towards greater flexibility is in part dictated by the changing needs of a new workforce. Compared to just the previous year, global business people report that they are seeing more consultants and freelance workers as well as older workers that are remaining beyond pensionable age. The expectations of greater freedom and flexibility that these workers have are certainly contributing to the popularity of mobile work. On the one hand, more and more workers are demanding a better work:life balance and choosing to go freelance or part-time to choose their own hours and location, while on the other, returning mothers and older workers are keen to remain in the world of work while juggling the demands of family and their health. These new types of workers are almost certainly in part responsible for the increase – 66% of respondents expect to see an increase in the demand for flexible workspace be it business lounges, co-working spaces, short-term offices or drop-in centres. From a business perspective working closer to home, but from a professional location provides access to technology (31%) and helps make useful business connections (31%). Business people globally confirm that working from home is not ideal and report that noise, lack of office resources and difficulties focusing on professional matters are a serious hindrance. One in ten also regard the financial cost of setting up a home office and running it as an obstacle. While the main issues with home working can be defined as ‘psychological’ as they really depend on the worker’s ability to remove their mind from household concerns, other issues are of a more practical nature and hard to resolve without serious investment in a fully equipped home office that is removed from areas of the home where household noises such as children playing, babies crying, dogs barking, washing machines spinning and doorbells ringing are not an issue. Unavailability of a fast or reliable internet connection is of course a major bug-bear and one that can only really be overcome by workers that live in well served urban areas reached by fiber optic for example. Countries where infrastructure is lagging behind or remote areas show a greater struggle with the issue. Working outside the home, but closer to home on the other hand could afford the answer as respondents report that it helps increase productivity and improves work:life balance. Slashing commute times is therefore not only seen as a business benefit allowing workers to spend more time at work, but also allows them to get home or wherever they need to be earlier. It follows that relationships with loved ones could benefit from additional time freed-up and less stress could also lead to improved health and happiness. Workers also report that being in a professional setting closer to home allows them access to technology and network without spending hours travelling. Businesses, however, will be particularly interested in seeing how likely productivity is to improve with the introduction or extension of flexible working. 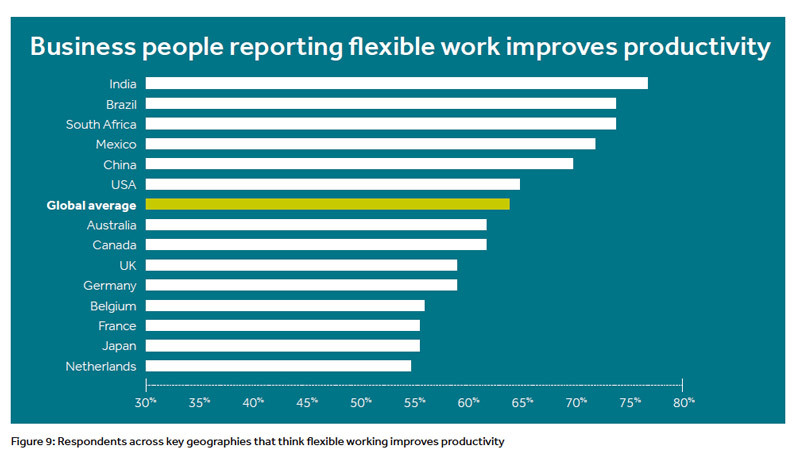 The results reveal that across key geographies more than half of respondents consistently think there is a correlation between flexibility and productivity with peaks in India, Brazil and South Africa. 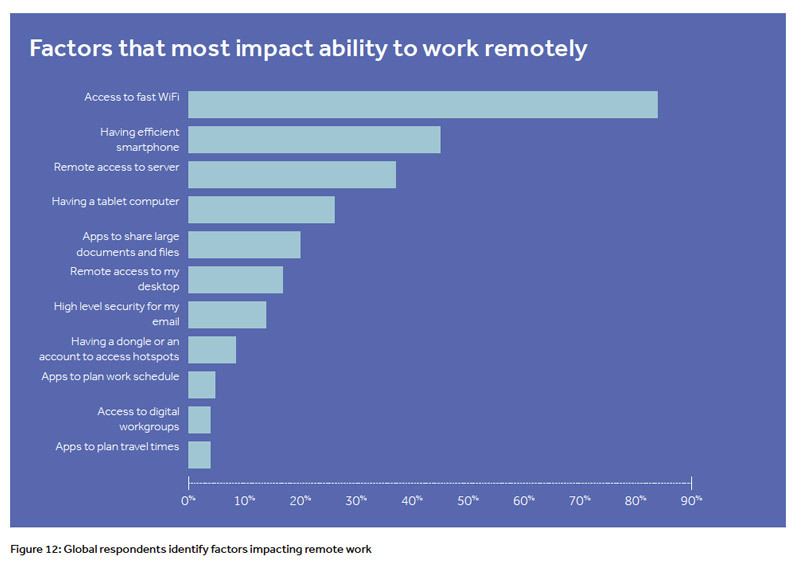 The second factor most likely to impact remote working is having an efficient smartphone (45%); only 26% say the same of a tablet computer suggesting that smartphones are the preferred technology for workers on-the-go. One of the key ways business people are using to remain always connected to teams and colleagues cost-effectively is Instant Messaging and VoIP. Not only is this solution cheap and speedy, but younger generations have been using them in their personal communications so long that transferring them to the workplace is only natural. In addition to this, 86% of workers believe that managers and staff should use instant messaging and the telephone to remain in contact. 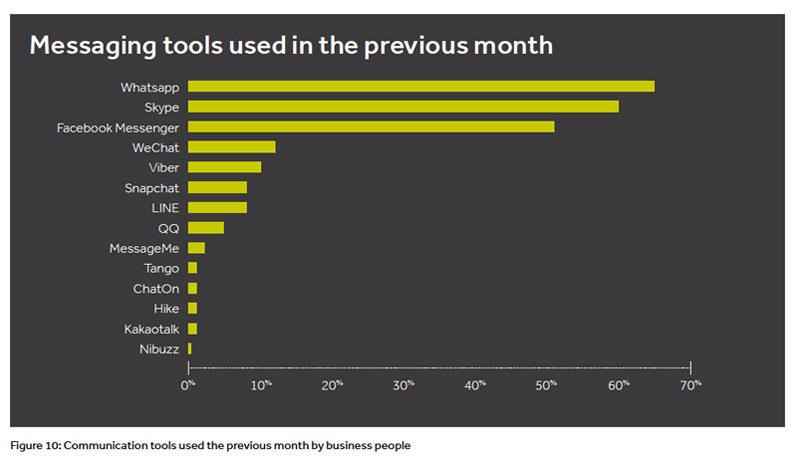 Specifically workers are using Skype (60%), WhatsApp (65%) and Facebook Messenger (51%). Compared to January 2015, WhatsApp has overtaken Skype in popularity among business users probably due to the introduction of VoIP and video calls making the tool even more versatile. In addition many users are finding that creating groups for communications that need to go out to the whole team is very practical. Important differences at geographical level do need to be taken into account with 98% of Chinese workers saying they had used WeChat, and 71% of Japanese users reporting they had used LINE, over the previous month. Along with communications, mobile workers are also using more and more online tools to help them work remotely more efficiently and productively. 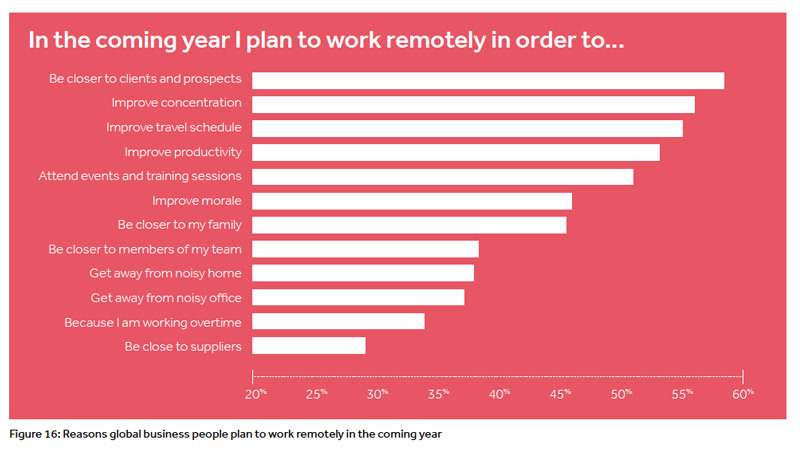 Regus research shows that these tools that enable remote working, whether by providing access to desktops remotely or making document sharing easier, are gaining popularity: Dropbox, the most popular solution, was used by 56% of workers in January 2015, but by 63% a year later. Similarly, Google Drive was used by 43% of workers and now by 50%. 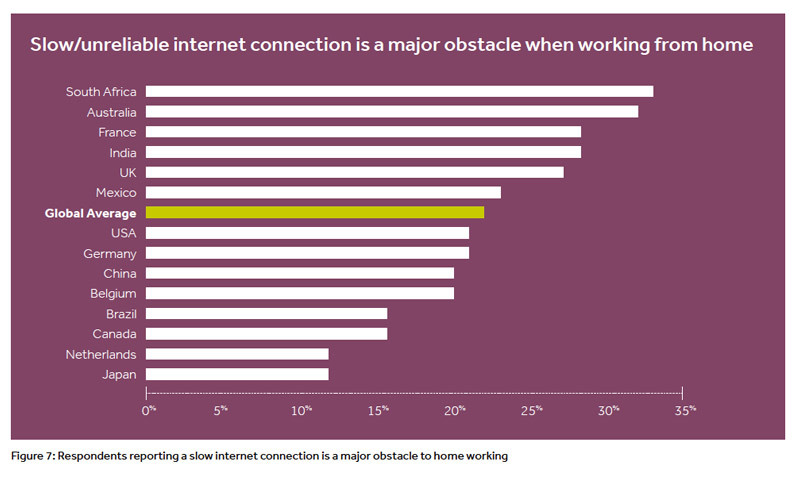 All these solutions have in common the fact that they require a stable internet connection and as flexible working continues to become more the norm, it is not surprising (therefore) that access to fast Wi-Fi or broadband impacts worker’s ability to work remotely most of all (84%). Remote access to the server is also an important factor, but scores much lower as, of course, access to the server also depends ultimately on a strong internet connection. Interestingly, mobile workers also clearly opt for having an efficient smartphone over a tablet computer or iPad to enable them to work . 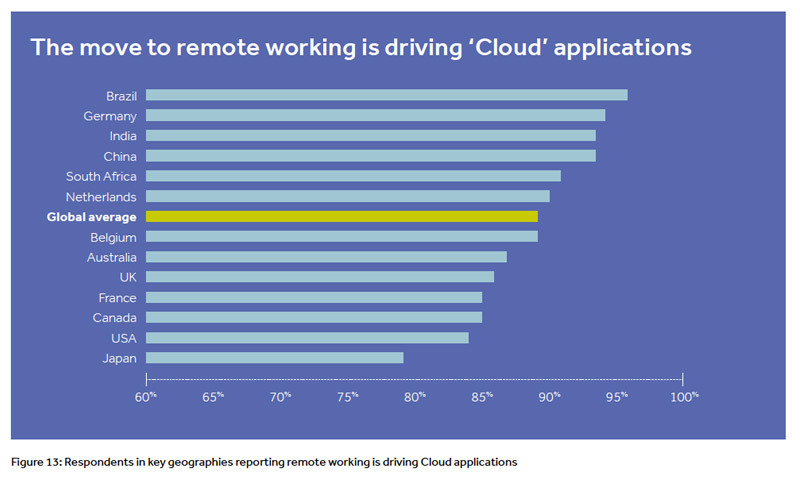 Mobile workers are also strongly driving the take-up of “Cloud” applications which can be accessed anywhere (89%). Almost a quarter of business people in fact report they had used server access in the Cloud in the previous month. Although mobile working is becoming more and more popular and appreciated by both businesses and workers, the issue of tracking productivity when not in the main office is one that most firms needs to address at some point. Only 66% of business people think that their business should use IT systems that track and measure levels of activity and productivity, favouring more traditional systems such as monthly meetings (82%) and phone calls (81%). Avoiding fixed leasing arrangements (37%) that hamper their need to expand and contract rapidly is also a key reason to opt for flexible working. Team managers and directors across the globe report that they plan to allow workers to work remotely either one or one to two days a week. This is roughly aligned with worker demand suggesting that there is no particular struggle between management and workers for flexible working, rather that it is understood and appreciated both ends. Just over one in ten, however, will allow workers to be remote the entire week. Among the reasons that have made mobile working mainstream are both personal and business benefits. In particular, business people report that it helps them be physically closer to clients and prospects, improve their travel schedule, and concentrate especially as a change of scenery often helps them regain focus. Productivity also therefore increases. Workers report that flexibility also has a positive effect on morale and helps them be closer to their family as they are able to get home earlier or to take part in activities such as the school run that a lengthier commute would have made impossible. With businesses reporting all these benefits it is hardly surprising that flexible working is expected to continue in its growth trajectory over the next year and longer. A third of firms (34%) report that they expect to see businesses of all sizes opting for flexible work locations rather than fixed term leasing contracts: 28% expect the trend to specifically concern boot-strapped small firms, but 18% think it will be large firms divesting expensive assets and moving staff to more flexible locations. While the main driver is of course the reduction of fixed office costs, many businesses have made agility a key part of their business plan and are choosing services and solutions that allow them the flexibility to expand and contract rapidly in response to market changes. It is clear that the world of work and the workplaces of today are quite different to twenty years ago. It is not just technology that is facilitating this metamorphosis (even though its role has been revolutionary) but it is people’s attitudes and mind-sets that have created the demand to work flexibly and promote agility. Business people’s priorities are shifting; more and more businesses are becoming open to valuing employees on performance and productivity rather than actual in-office face-time, meaning a mobile workforce is evolving quicker than ever. With progressing technology and the increase of available products on the market, business people are able to carry out the same tasks remotely which they previously would have performed in a permanent office. Cloud applications let workers access files remotely, while VOIP calls and instant messaging apps are an easy and cost effective solution to ensure all colleagues stay connected, all of which are bringing benefits to businesses and workers alike. 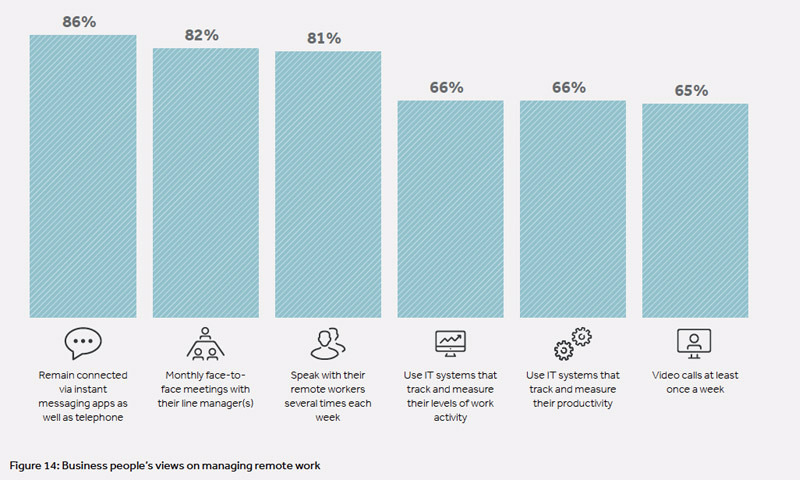 More and more businesses are adopting a flexible mind-set when it comes to managing remote workers, but their views on how to achieve good management are surprisingly traditional; rather than simply investing in IT systems to track staff productivity, they reveal that conducting regular meetings (videoconferencing and in person) and telephone calls are proving critical. Instant messaging is also seen as key way of keeping teams connected. While flexible working is becoming the norm and is widely regarded as highly productive and beneficial to client relationships it is important to note that it should not be regarded as synonymous with home working. Working from home in fact carries several perils as the distractions can be damaging for productivity and household noises can create an unprofessional environment. Yet, working from a professional location close to home is seen as ideal as it allows workers to spend more time on leisure and with their loved ones, as well as cutting down commute times and finding more time to relax, thus resulting in a better work:life balance. Millennials are making their presence in the business world known by their need to be able to constantly communicate no matter the location, at a cheap cost. This is a generation that depends on being connected by technology, so it is no surprise that they are looking to carry out their work tasks from where they choose. On the other end of the spectrum, older workers are occasionally forced or choose to stay employed for longer so adopting a flexible working attitude can help them to combine their personal needs with their employment responsibilities. The research shows just how wide-spread flexible working is becoming and how fundamental technology is as an enabler of mobility. As the world of work continues to evolve, with more and more flexible workers such as consultants, part-time workers and freelancers composing the workforce, businesses and their employees only stand to gain from their intention to continue embracing agility and to break free from the fixed leasing arrangement mentality. Over the past ten years, Regus has invested in analysing working habits and behaviours in the world of business. 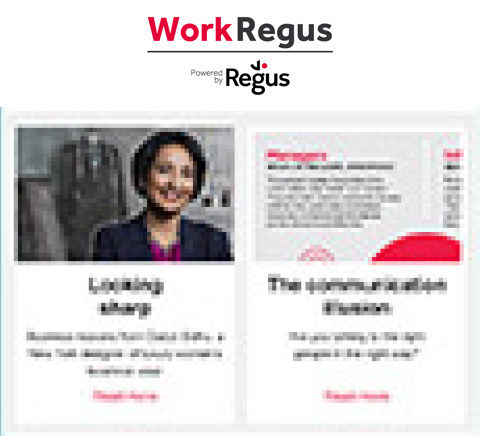 From where people work, to when and how they manage their work, Regus has also analysed the demands of workers, what makes them tick and what they do to try and reconcile the demands of their professional and personal life. This survey, taken in tandem with strong growth and increased competition in flexible workspace provision, clearly indicates that demand will increase through to 2020 and beyond. This is an important indicator for businesses planning on managing their space efficiently as it means that fixed desks in major office locations are at high risk of being under-occupied. In September 2015, a fifth of business people reported that reducing leasehold property under-occupancy was a key driver for flexible working and 58% said they would be reducing overheads. The commercial property world appears therefore to be on the verge of structural change, with mobile workers making a significant proportion of traditional fixed office space obsolete and inefficient. With more and more people working remotely at least part of the week, businesses of all sizes will be faced with the option of paying for empty desk space or cutting down on permanent office space and opting for more flexible solutions. These agile options range from co-working spaces to temporary office locations and business lounge membership for employees. In addition to this, 31% of business people in September 2015 reported that they would be hiring more freelance workers and less full-time staff, this result is confirmed by 29% of respondents that report they are seeing more freelance workers compared with the year before. The trend for increasing numbers of freelance workers flooding the world of work is aligned with reports suggesting that in a not too distant future the business-employee model will become obsolete and workers will all be consultants. In the US the freelance workforce grew to 55 million in 2016, up 1.3 million from 2015, while in their Workforce 2020 report SAP and Oxford Economics predict that the workplace in 2020 will be much more flexible with 83% of executives planning to increase use of “contingent, intermittent or consultant employees in the next three years, forcing change on companies." Over the next decade the workforce is set to radically change becoming location agnostic. A growing number of flexible types of workers such as freelancers, contractors and part-time workers will make the demand for large fixed office locations rare and will instead drive the need for small, flexible office leasing arrangements, business lounges, co-working spaces and professional meeting rooms. Businesses need to be future-proofed for these changes so they are able to embrace agile work trends and manage growth efficiently. More than 20,000 business respondents from more than 100 countries were interviewed via an online survey during September 2016. These were sourced from Regus’ global contacts database of more than 2 million business-people worldwide, which is highly representative of senior managers and owners in business across the globe. Respondents were asked about their views on the effects of flexible working on workers, management and businesses. They were also asked about workforce composition and how the world of work has changed and is expected to change. 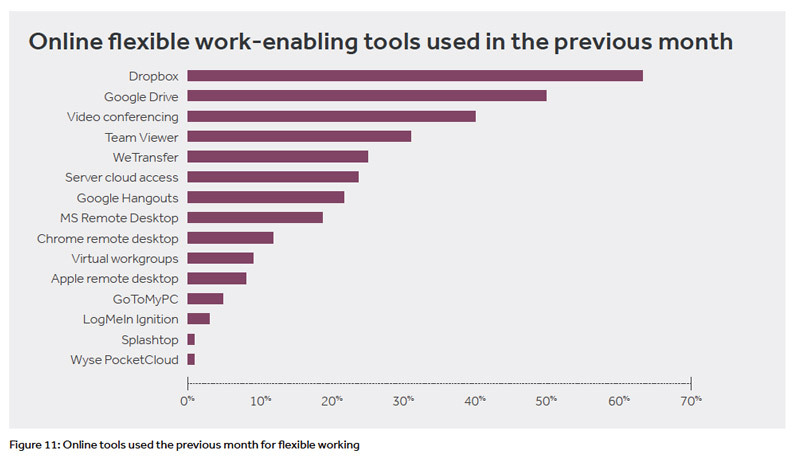 Respondents also provided information about the mobile work technologies they used in the previous month and key enablers for remote work. The survey was managed and administered by an independent organisation.